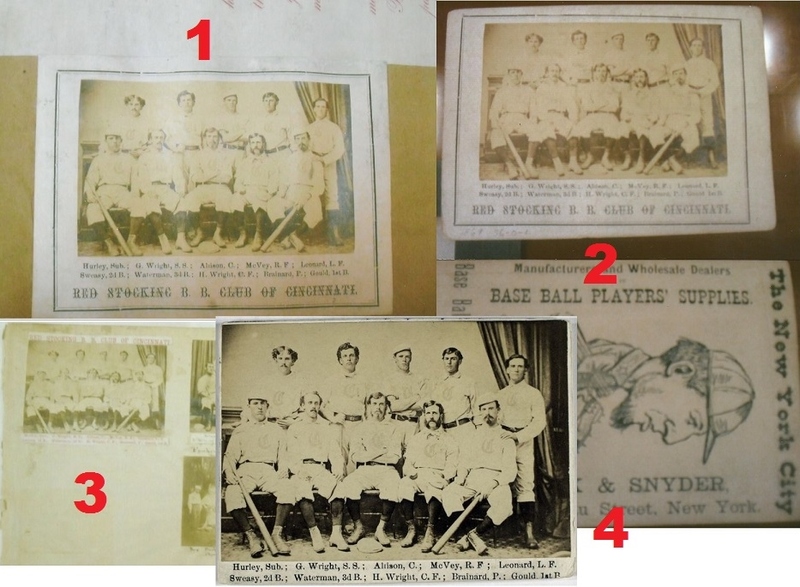 Heritage Auction Galleries in Dallas, Texas, removed a valuable 1869 Red Stockings Peck & Snyder trade card from its upcoming sale at next weeks National Convention after Hauls of Shame published a report showing that the card was stolen from the New York Public Library’s famous Spalding Collection. The card, owned by Net54 moderator Leon Luckey, was purchased at a 2000 MastroNet auction conducted by partners Bill Mastro and Rob Lifson and represents only one of several copies of the same card that have made their way out the front door of the Fifth Avenue branch of the library. Luckey recently locked a thread about the scandal on his collector internet forum as members were highly critical of his conduct in offering the card for sale while knowing it was suspected to have been stolen from the library. Based upon Heritage’s lot description, which mentions that the card shows evidence of a stamp on the reverse, it is clear that both Luckey and Heritage were aware that the card was very likely stolen property, yet failed to inform prospective auction bidders. In fact, one source familiar with the FBI investigation into the provenance of the card told Hauls of Shame that Luckey was actually informed that the card was stolen when it was returned to him at the convention last year. Leon Luckey posted a high resolution scan of the back of his 1869 P&S card from 2007 to 2010 (left) but intentionally reduced the resolution by at least 30% in 2010 (right). The reduction in the image quality made it impossible to identify the remnants of the NYPL ownership stamp. In addition, Hauls of Shame has uncovered evidence which shows that Luckey also removed high-resolution scans of the back of his card from his website in May of 2010 after we published several follow-up articles about the NYPL thefts first highlighted in the New York Times in July in 2009. Luckey reduced the resolution by at least 30% rendering it nearly impossible to identify the NYPL ownership stamp on the reverse. Heritage’s removal of the card made national news when the New York Daily News reported that the “FBI is working with NYPL officials to determine if (the) rare 1869 trade card that had been offered by the Texas auction house was stolen from the library’s Spalding Collection decades ago.” Daily News reporter Michael O’Keeffe failed to acknowledge that Hauls of Shame broke the story first based upon visual evidence posted in our last report. O’Keeffe also quoted Heritage’s Chris Ivy as saying, “Heritage Auctions has no interest in selling stolen material.” Heritage has previously removed two other items stolen from the NYPL, an 1879 player contract of Ezra Sutton and an 1894 season pass which once belonged to baseball pioneer Henry Chadwick. The 1869 card removed from the Heritage sale was sold to Luckey by Mastro and Lifson in 2000 but it was also sold previously by Lifson in another Robert Edward Auctions sale in 1997. O’Keeffe and the Daily News failed to report that fact and that they had published an article in 2009 about the NYPL thefts in which Lifson lied to O’Keeffe and stated he never stole materials from the NYPL collection. Lifson, however, later admitted on SI.com that he had been caught stealing from the Spalding Collection when he was a student the Wharton School of Business at UPenn. Lifson also oversaw the sale of scores of other stolen items from the NYPL when he acted as the consultant to Sotheby’s 1999 Barry Halper Collection sale. Lifson was a long-time supplier and a close confidant of Halper who has also been accused of masterminding the NYPL heist in the 1970s. Halper, the deceased former New York Yankee partner, was also a close friend of New York Daily News reporter Bill Madden who acted as his personal PR representative and published dozens of articles and personal profiles of the collector spanning from the 1970s through 1999 when Halper sold a portion of his collection to MLB and the Baseball Hall of Fame for $8 million. Several million dollars of that material, however, including a jersey and bat attributed to “Shoeless” Joe Jackson, were exposed as fakes by Hauls of Shame in 2010, and since that time Madden, O’Keeffe and editor Teri Thompson have protected both the deceased Halper and his associate Lifson. O’Keeffe even published an article recently lauding the disgraced Halper as a collecting inspiration for Hall of Fame pitcher Randy Johnson. 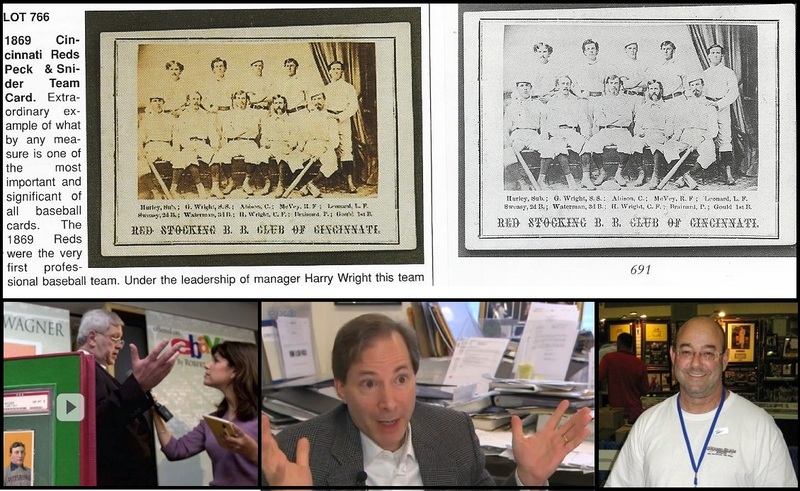 Bill Madden revealed Halper's ownership of the stolen Harry Wright correspondence in his 1977 TSN column and the KC Star reported that Halper allegedly paid $3 for his 1869 Reds Peck & Snyder card (inset right). 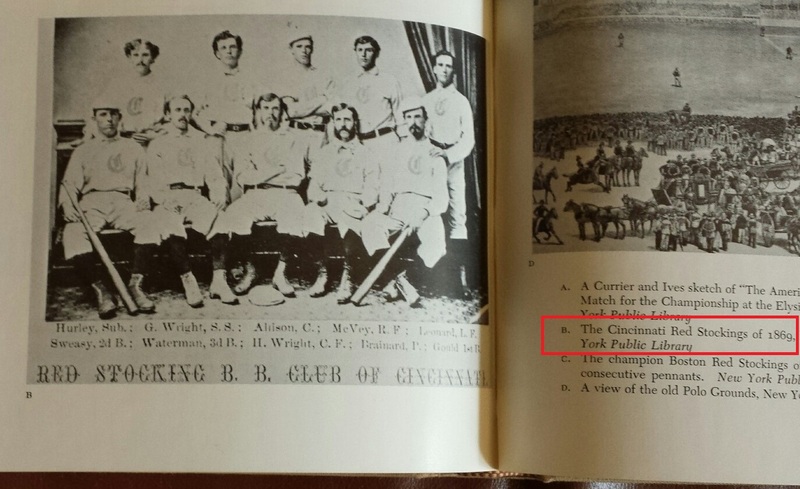 The NYPL currently has four Peck & Snyder trade cards of the 1869 Reds. 1.) Pasted in Harry Wright's scrapbook. 2.) Recovered by FBI c. 2009 with no visible stamp on the reverse. 3.) A trimmed copy pasted into Henry Chadwick's scrapbook. 4.) A trimmed copy with no visible NYPL stamp on the reverse which appears on the NYPL website. Back in 1985, dealer Lew Lipset claimed in his Old Judge newsletter that he had knowledge of “10 to 12″ existing 1869 Reds cards. Today there are approximately 35 copies of the Peck & Snyder Red Stocking trade card known to exist and the New York Public Library currently has four examples in their possession. The library once had at least seven copies in its collection including three examples that were stolen, one of which being the Heritage auction lot in Leon Luckey’s possession. The second stolen copy was removed from a Legendary auction in 2012 and is currently in the possession of dealer JC Clarke. The third stolen copy has never surfaced publicly since it was credited to the NYPL in the 1960 book Baseball: The Early Years by Dr. Harold Seymour and Dorothy Seymour Mills. The library also recovered another stolen copy via the FBI in 2009, but prior sales of that example are unknown. This NYPL copy of the 1869 Reds card was documented as library property in the 1960 book Baseball: The Early Years ny the Seymours. The card has never surfaced publicly since the book was published in 1960. The example that was withdrawn from Legendary Auctions at the 2012 National Convention was traced back to the estate of a deceased post card collector from New York City. As reported in our last article, Leon Luckey’s card can be traced back to Lifson’s 1997 Robert Edward Auctions sale and a Christie’s sale in 1996. Lifson’s 1997 lot description made no mention of the ink spots on the back of the card and called it “one of the finest examples of this great rarity known to exist.” When the same card was offered at Christie’s in September of 1996 it did not sell as bidders failed to meet the high reserve price. A source with intimate knowledge of the Barry Halper collection back in 1996 tells Hauls of Shame he believes Halper consigned the 1869 Reds card to his friend Don Flanagan, at Christie’s, and then after it failed to sell consigned it to Lifson’s sale in 1997. In that same REA sale, Halper also consigned his most prized possession, the uniform Lou Gehrig wore when he made his “Luckiest Man” speech at Yankee Stadium. Lifson, however, made no reference to Halper’s ownership of the uniform in his lot description. In the mid-1990s Halper sold many choice items in his collection after his family business, Halper Brothers Paper Products, went bankrupt and he was embroiled in litigation with his cousins who owned the company with him. Halper claimed to have acquired the Gehrig uniform directly from the slugger’s widow in her apartment but, as will be revealed in our upcoming book The Madoff of Memorabilia, Halper’s acquisition story was a total fabrication. In 1999 Halper sold a different 1869 Reds Peck & Snyder card when Lifson worked as the special consultant to Sotheby’s for the Halper Collection sale. That example of the card is also under suspicion as being stolen from the NYPL and in the Sotheby’s catalog Lifson did not show an image of (or describe the condition of) the back of the card which sold for $9,775. The stolen 1869 Reds trade card appeared in REAs 1997 sale (top left) after it failed to sell in a 1996 Christie's auction (top right). A source claims that Barry Halper consigned the card to his friends Don Flanagan (bottom left) and Rob Lifson (center). Current owner Leon Luckey (bottom right) is left holding a very expensive bag. The NYPL did not respond to our inquiry asking for an update on the status of the recovery of Luckey’s stolen card. Sources indicate that the card is still in the Net54 moderator’s possession. The NYPL also failed to respond to our inquiry asking to explain why they had recently filed a lawsuit and were pursuing criminal prosecution against a woman who tried to sell a Benjamin Franklin manuscript stolen from the library. Wow, Leon engaged in a cover-up to hide the stamp on the back of the card? You mean an unemployed, convicted drug dealer would do such a thing? And he lied about what the FBI told him about the card so that he could sell stolen property? Well, I’ll just wait patiently white he posts the findings from his “investigation” about the card. And why is it that Leon calls three respected collectors “vile prick,” “idiot” and “liar” when he’s the only one of the four who’ has ever been accused of hobby fraud, is the only one of the four with a criminal conviction and rhe only one without a job? I’m glad to see that sometimes the FBI actually pays attention to your revelations so that they have some effect. is anyone getting arrested? are they still in business? ANSWER IS YES! I’ve collected sports memorabilia since the 70’s and its amazing how corrupt this hobby has been, from these clowns to the operation bullpen mess in the 90’s, and I’m sure there’s much more we don’t even know about. This was a fun hobby but now its all about greed and its full of crooks, conmen, and thieves. Unemployed? Don’t be fooled, Net54 is not a charity forum owned and moderated by Leon. He makes a modest living off the site revenue! I have every auction catalog from as far back when the hoppy was starting to take off thanks to Mickey Mantle and has I thumb threw some of the Mastro catalogs I just wonder how much bogus items they were auctioning off way back when. It a shame, truely a shame that no wonder kids dont collect anymore. Discussing Leon’s involvement is censored on Net54 and censored on PSA Collectors Forum… Hmmm…. As I follow Peter Nash’s “Hauls of Shame” column I mostly think of the pillaging of our history…because baseball history is not only baseball history. Several of my learned colleagues in SABR’s Nineteenth Century Committee have pointed out to me that the theft of historical baseball artifacts from our libraries, museums and other archives is just the tip of the iceberg, as this crime knows no subject boundaries. We are fortunate to get some sense of how our world of baseball historical research is being impacted by these losses. Now, consider all other disciplines of historical study along with the documents and artifacts which support such work. Perhaps, “Hauls of Shame” can serve as a prototype for a National or even International media linked data base to bring focus (and possible recovery of items) to a problem of immense proportion. I did nothing wrong. I just bought a baseball card. Bringing up Leon’s conviction is stupid. Why? Everyone in this hobby has done far worse than Leon has ever done. This hobby is plagued with criminals that just haven’t been caught. It’s easy to pick on him (and I am no way saying he’s got a halo), but I am saying that there are far worse people out there and the National this week will showcase the scum of the scum behind booths. We complain, complain, complain about the hobby but until the government cares, all we can do is complain and the government needs to recognize that this is a serious problem. So attempting to sell a stolen card from the NYPL to make a 90k profit (minus commission) doesn’t warrant jail time? Give me a break. This is why this BS fraud goes on. I hope the Feds make an big example of Leon Luckey to send waves through the collecting community. Maybe he can be put in a cell next to his buddy Mastro. I say put Leon Luckey on the stand and let the beans start spilling! Maybe the Feds are waiting for The National. Many of the rotten eggs in one basket so to speak. “Everyone in this hobby has done far worse than Leon has ever done”, really? Ron your an idiot, you must be Leon’s Daddy. I’m hoping for a followup article on WHAT happens to the stolen 1869 card found to be in Luckey’s possession. If the NYPL doesn’t persue its return its a shame and slap in the face to the original donators intentions. Leon takes more heat on this — justifiably so — because unlike the numerous scumbags who will flock to Chicago for the Nationals this week, he owns a hobby message board on which he repeatedly boasts that he fights fraud in the hobby (more than 99.9 percent of other people, no less). So when the Gaped Crusader — who has the FBI on speed dial — repeatedly gets caught exhibiting unethical and unlawful behavior, then, yes, he’s going to be criticized. Leon always has wanted to have it both ways. He wants to say he fights fraud and then also benefit from fraud. He wants to sell ads on Net 54 but then say that he doesn’t protect advertisers (use the 54 search function to read what a joke this claim is). He has invited all of the harsh posts on this website because he decided to censor them on his own. Another brilliant move. Leon likes to dish it out but can’t take it… I hope there is a followup to what happens to the stolen card and NYPL does pursue legal matters. What is the latest? Has the card been returned to the NYPL? No arrest yet? The card needs to be retuned ASAP if it has not been. People on Leon’s message board started a thread which criticized him… He locked it. Someone later started a thread telling a story of how Leon threatened him at the National this week for talking bad about him on the thread… Leon replied by saying he had “no comment” and then later added something (when the new thread started picking up steam) to the effect of “can’t we get back to baseball card talk? ?” The chatter at the National was that a lot of people have lost a lot of faith and respect for him. Y.T. B.B.O.C. get your facts straight, the locked thread was not about Leon, it was about the Mastro Sentencing Hearing……….. It just escalated from there. Any expensive collectible gets faked. A sad fact of life. I can say for sure that the one Rick Barudin sold had to be legit. I started buying from Rick and then partner Buddy Kurzweil starting at age 8 when the original Sports Corner opens in Montvale, NJ. At some point the 1869 showed up as the only card card in the case that said not for sale. Being an average kid my budget was about $5 per visit back in the ‘70s. If only I could have purchased the card next to the 1869. A great condition T206 Honus Wagner…for the then insane price for a baseball card of $150!?!! I last saw Rick & Buddy around 1982 when I was in the business part time and getting ready to head to college. Their store was definitely like walking into a candy store for this kid. If only I had more money!!!! !